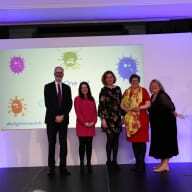 The awards on March 25, honoured the hard work of flu fighter teams around England who endeavour to keep those in their care safe from the risk of infection. Karen Johnson, HC-One’s Head of Clinical Quality, said: “We are absolutely delighted to have won the Best Flu Fighter Care Campaign, particularly in our most successful vaccination year to date. The campaign, which saw HC-One’s senior management team and Board sharing pictures of themselves doing taking part in the vaccination programme through internal communications and social media, delivered a 68.8% year on year increase on flu jab take up, with more than a quarter of the provider’s 350 care homes achieving a 100% staff and resident vaccination rate. Alongside dedicated ‘Flu Champions’ on the ground in each home encouraging vaccination, HC-One also had a ‘Flu Fighter’ helpdesk which gave staff the opportunity to raise questions or concerns anonymously and allow the Flu Fighter team to offer advice and support. The post HC-One scoops NHS Flu Fighter prize appeared first on Care Home Professional.